A weak group in the center, cut off from the sides, where it might have made a base. RafaelCaetano: But it might also be on the side, right? Alex Weldon: Depends on what you mean by "on the side." The only way I've ever heard the term applied is as this original definition said; a group without clear eyeshape, and no route to the side of the board. 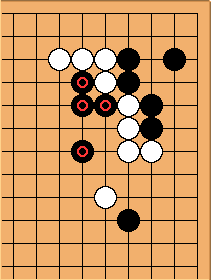 I.e., if you've got stones on the fourth line, and the opponent manages to slide in under them on the second line to take away any potential eye-space on the side, you'd call them "floating." So, basically, the important thing is not the absolute position of the group, but its relative position; if there is a strong enemy group between it and the nearest edge, it's floating. SnotNose: A group without clear eyeshape but with access to the edge is usually said to be without a base, but not floating. atomicHolt: I'd always thought "floating stones" was the hand of god; where, on your first move, you use telekinesis to place your stone (where ever you want, it doesn't matter), and the other player, of course, immediately resigns.